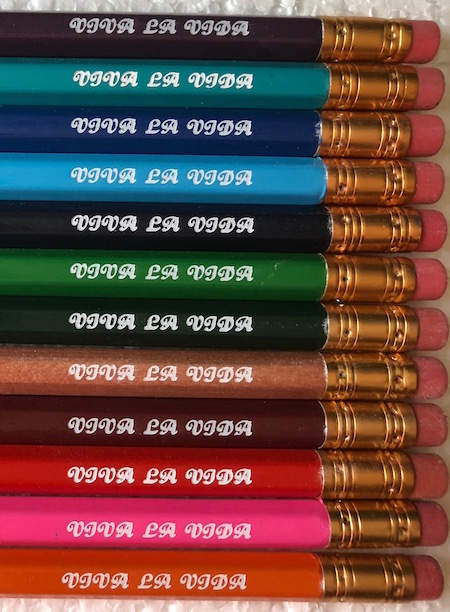 The following samples from prior custom printed, personalized pencil orders demonstrate the wide variety of fonts and color combinations Explicitly Yours™ offers. Bernhard Medium font [found in Hexagonal Pencils - Typical Sized Print link above]. On Natural Lacquered pencils with copper ferrule with copper print (weak contrast) that works because UPPERCASE letters in a medium/bold font was used. Weak contrast with lowercase letters will be very difficult to read. The vertical line symbol is only available with the Pencraft font [found in Hexagonal Pencils then Large Print link] but the text is Old Colony [also Hexagona Pencils with Large Print font list]. This is a rare example of when mixing fonts is possible. 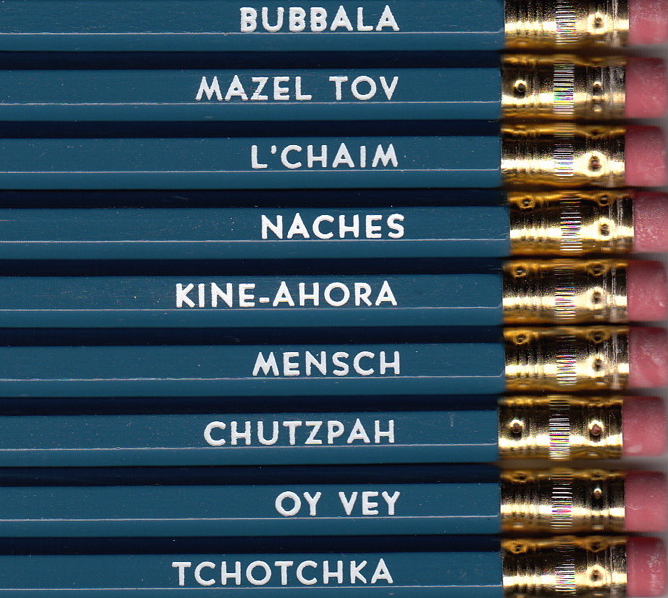 These are dark green pencils with gold ferrules using white print for strong contrast making the text easy to read. Margery font [found in Hexagonal Pencils then Large Print link] on orange, red and burgundy pencils with gold ferrules and pink erasers using white print. Great contrast & a unique font with lots of personality! Gloria Script font [found in Hexagonal Pencils link - Large Print] in green print on a pastel green pencil with gold ferrule and pink eraser (pencil looks darker than it really is). Cloister Script font [Hexagonal Pencils then Large Print link above] on a violet pencil with gold ferrule and pink eraser with white print. Superb contrast to be able to see the beautiful text. Freehand Script font [Hexagonal Pencils then Large Print link above] in white print on royal blue pencils with copper ferrules and pink erasers. Chief Pencilier Gail especially loves this font because it looks like you've written it. ARIAL font [available in both Hexagonal Pencils with Typical or Large Print] available on black pencils with copper ferrules and pink erasers & white print. Show here is the typical sized print. STUDIO font [found in both Hexagonal Pencils then Typical sized print or Large Print links above ]. On black pencils with copper ferrules and pink erasers with an outlined square symbol in metallic sage (light green) print. To order a symbol, either add a comment when checking out or copy and past a square from the internet into your text. Only the listed symbols on the chart on the bottom of the order page are available. Just because a computer can generate a symbol or symbol combination does not mean we can print it. GOUDY HANDTOOLED SHADOW font [found in Hexagonal Pencils then Large Print]. Printed here on burgundy pencils with gold ferrules and pink erasers with a heart symbol using white print. There is no extra charge for using a heart symbol. It may or may not work on your selected font. Century Schoolbook Italic font (no numbers available) [found in Hexagonal Pencils then Large Print link above]. Printing in matte gold on brown and bright blue pencils with gold ferrules and pink erasers. Large Helvetica with Diacritic Vowels font [found in Hexagonal Pencils then Large Print link above] is the only font offering Diacritics and so we will use it only on orders with diacritics. 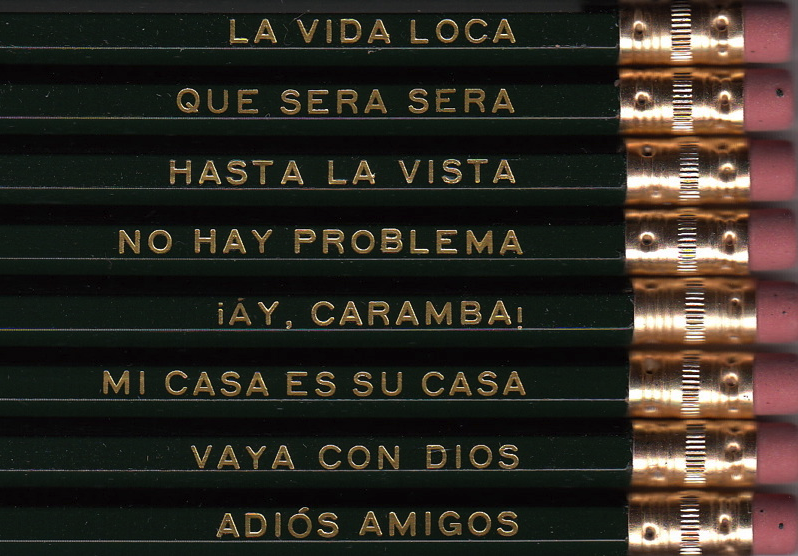 Dark green pencils with gold ferrules and pink erasers using gold print for Spanish language text. BERNHARD GOTHIC MEDIUM font [ found in Hexagonal Pencils then Large Print link above]. Bright blue pencils with gold ferrules and pink erasers using white print for excellent contrast making the text extremely easy to read. Roundhand Script font [Hexagonal Pencils then Large Print link above]s beautiful. These are creme colored pencils with gold ferrules and pink erasers using dark purple print. PALANTINO ITALIC font [found in Hexagonal Pencils then Typical print size link above] . These are white pencils with copper ferrules pencils and pink erasers using red print. BROADWAY font [found in Hexagonal Pencils then Typical print size link above]. These are Natural Lacquered pencils with copper ferrules and pink erasers using white print. Not sure why, but many teenage boys love this font. Cloister Italic font [found in Hexagonal Pencils then Large Print link above]. Another example of this special, beautiful font with ornate brackets. Shown here are pastel pink pencils with silver ferrules and white erasers using rose print. We love this color combination! stymie bold italic font - lowercase lettering only [found in Hexagonal pencils then Large Print link above]. Orange pencils with gold ferrules and pink erasers and white print. Great contrast. Law Italic font [found in Hexagonal Pencils then Large Print link above]. White pencils with copper ferrules and pink erasers using metallic gold print with a star symbol. No extra charge for the star symbol, but it may or may not work with your selected font. COPPERPLATE BOLD font [found in Hexagonal Pencils then Typical size print link above]. Black pencils with copper ferrules and pink erasers using white print. BODONI ULTRA BOLD font [found in Hexagonal Pencils then Typical size print category]. These are dark green Dixon pencils with gold ferrules and pink erasers. Pencraft font [found in Hexagonal Pencils then Large Print link above]. Shown here on Natural Lacquered pencils with gold ferrules and pink erasers using turquoise print. Elite Underwood Typewriter font [found in Hexagonal Pencils then Large Print links above]. Shown on black pencils with copper ferrules with pink erasers using white print. The text says Enough already in Spanish.